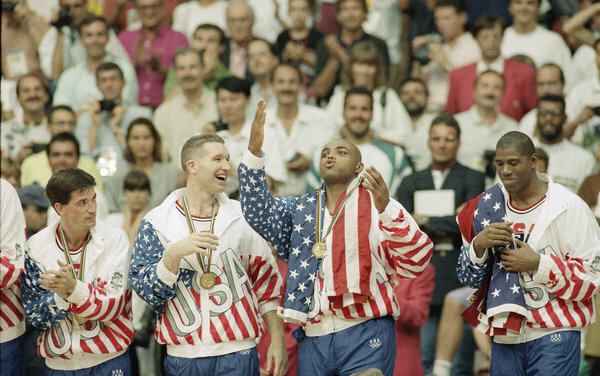 Picture of Charles Barkley and Magic Johnson with the American flag draped over their shoulders to cover the Reebok logos on their jacket. Barkley and Johnson had agreements with other footwear brands. John Stockton and Chris Mullin, 1992 Dream Team teammates, look on. Fact #1: Only 10 NBA players currently have their own “signature shoe” with a US-based brand. In case you’re interested, they are: LeBron James, Kobe Bryant, Kevin Durant and Kyrie Irving at Nike; Chris Paul, Russell Westbrook and Carmelo Anthony at Jordan Brand; Derrick Rose and Damian Lillard at adidas (James Harden’s shoe will launch in 2017); and Stephen Curry at Under Armour. Fact #3: Every player in the NBA has a relationship with a sneaker brand; even the benchwarmers, players looking just to make a training camp roster, can get what is called a “merch” deal. Such an agreement with a footwear marketer gets them a free allotment of footwear for practices and games. Fact #5: Nike has dominant share of the NBA player market, as 68% of the 300+ players wear the Swoosh. Adidas is number 2 at 15.6% with about 70 players wearing the three stripes. Posted in Basketball, Business, Other Olympics, Others, Pop Culture and tagged Adidas, Andrew Wiggins, basketball, Carmelo Anthony, Charles Barkley, Chris Paul, Damian Lillard, Derrick Rose, James Harden, Kevin Durant, Kobe Bryant, Kyrie Irving, Lebron James, Magic Johnson, Michael Jordan, NBA, Nike, Reebok, Sneaker Wars, Stephen Curry, Under Armour. Bookmark the permalink. Roytoni: I have read ever post made on the site for 2020 Games. I have published a book on changes made in International rules and Olympic Games rules. One chapter deals with the shoe war in Mexico City which instigated changes that finally brought Professionalism to the Games. It goes much farther than Sneaker Wars with behind the scenes happening at ever Olympic from 1964 thru 2000. Olympian Historians have found it exciting. Ollan – thank you! I didn’t know your book – Inside the Five-Ring Circus – was out! I will buy it ASAP. I can’t wait to read it.